Update 2 — September 22, 2011: I have recently started doing Crossfit workouts again. I switched to conventional strength training (see update below) for a while, but have now returned to Crossfit’s more intensive calisthenics workouts. I’m finding that cycling between the two is beneficial. Update: this post is from 2009. For my more recent thoughts on fitness, see this April 2011 post. About a year ago, my pal Danny, a trainer in New York City, introduced me to Crossfit, a fitness regimen that has changed the way I think about physical training. Crossfit is a fitness philosophy that incorporates calisthenics, running, jumping, and weight lifting done at high intensity, usually for short periods of time. The Crossfit Wikipedia page has a good overview. You can find more info on the official Crossfit site, on the What is Crossfit? page. Simplicity — as you’ll see in the sample workouts below, a typical training session is quite straightforward. There’s a focus on calisthenics — exercises that involve moving your own body weight, like push-ups, pull-ups, sit ups, and squats. A word about pull-ups: Crossfit philosophy advocates kipping pull-ups, which are different than standard, dead-hang pull-ups. In a kipping pull-up, you swing your body and drive your hips upward, using your entire body to raise your chin over the bar. This can be difficult to learn, but the idea is that you can do more pull-ups in less time this way, and thus work your muscles more intensely than you can with dead-hang pull-ups. A couple of good kipping tutorials can be found on YouTube here and here. Intensity — Many Crossfit workouts last 20 minutes or less. But you push yourself as hard as you can for the given amount of time. The workouts, which resemble interval training, tend to be short and punishing (with occasional long runs and rowing workouts thrown in for good measure). My sense is that this produces better fitness gains than the typical gym route: a run at a moderate pace followed by some resistance training. This recent New York Times blog post contains more info on the benefits of interval training. Everything is measurable — nearly every workout is done for time. So while workouts are highly variable, when you do repeat a given workout, you can check to see what your previous time was and try to beat it. Variety — Crossfit is cross-training to the extreme. The notion is that every workout should challenge your body in a different way. I’ve never done a boring Crossfit workout. Crossfit is unconventional — the philosophy challenges our traditional ideas about fitness. In Western society, as Crossfit devotees point out, we tend to hold up the endurance athlete as a model of fitness. But Crossfit proponents would argue that the decathlete should be the gold standard of physical fitness. So what’s a Crossfit workout look like? Here are a few of my favorite routines. You’ll see that compared to the workouts posted on the Crossfit main page, these tend to avoid olymypic-style weightlifting. 5 pull-ups, 10 push ups, and 15 squats; repeat. Deadlift and fast run: do 5 sets of 5 repetitions of the dead lift (5,5,5,5,5), then run 1.5 miles for time. Double-unders and situps: For time, do 50/40/30/20/10 reps of: Double unders (jumping rope — the rope passes under your feet twice during one jump) and sit-ups. That is, do 50 double unders, 50 sit-ups; 40 double unders, 40 sit-ups…down to 10 and 10. Burpee madness: 100 burpees for time. What’s a burpee? It’s a pushup with a jump at the end. Here’s a video demonstration. And here’s another. Do a bunch of these for time and your cardiovascular system will be reeling. It’s worth nothing that Crossfit is not without its critics. Some people point out that some of the exercises, if done incorrectly, are dangerous. That’s true. If you’re learning new movements, like the squat, ask a trainer or someone knowledgeable to help you. Some people also argue that the Crossfit community is unfairly dismissive of conventional gym-goers, and that some of those who undertake Crossfit training seem to…well, take themselves too seriously. I think this is also true. Here’s an overview of Crossfit’s unique culture from the New York Times. Worth a read. Do you Crossfit? If so, why do you like it? Leave a comment below. Not a fan? Tell me why. Good Crossfit workout suggestions? I’m all ears. Hi. You would only do a workout like Cindy or the 100 burpees workout in one day. Hi Timberli — Yes, you can do squats without weights as part of Crossfit workouts. They’re usually called “air squats,” and many Crossfit routines include them. If you search Google for something like “bodyweight crossfit workouts,” you should find several. Unfortunately, in this clip the people doing kettle bells had poor form. Not using gluteus/hammies to thrust the bell forward, and “lifting” the weight in every shot I saw… But great to see the world of criss fit making a whirlwind impact in more peoples’ lives!! 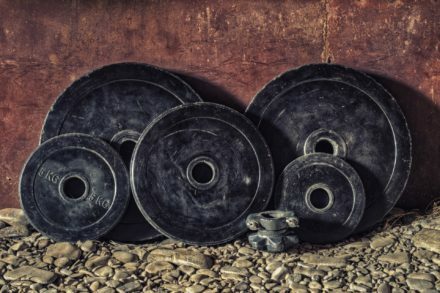 Came across CrossFit in January – I have been looking for “more” when I go to the gym – I am a 45 year-old female and wanted to amp up my workouts… I have been working out with a 23 year old girl who is intense… We do not use the weights posted (too much for us) and we modify a bit if need be – but the workouts are AMAZING – box jumps, pull ups, push ups, squats….holy crap – I have been sore in places I didn’t know I had! I am already seeing a difference in my body – and I am amazed at how much I can do – and how quickly I am becoming better at each exercise and amount of reps…. 200 sit ups????? WHAT!!?!?!? Could barely make it through that first time – took me forever…stopping and starting… did 100 last night like it was nothing…. I highly recommend for those people with limited time… workouts are intense but quick! (thank god). Excellent. Great to know, Coran. Appreciate the info. I have been “cross-fitting” for 6 months and LOVE it! I have tried a plethora of workouts (yoga, bikram yoga, zumba, step, running, body pump) and I would have to say that crossfit has produced the best results…and I have stuck with it, as it is always new and you don’t get bored! @Beau , @Rick — sorry for the confusion. The comment from @Preeti refers to a new Crossfit gym opening, apparently, in the Washington, D.C. area, not here in Bangkok. As far as I know, there is still no Crossfit gym (or any officially organized Crossfit activities) here in Bangkok. But as I mentioned, I’ll update this post if anything changes. Where is that? I’m also visiting bkk for three months and i’d love if icould crossfit! Is it still open? I have a non-crossfit friend in Bangkok with two months to kill… a name or a map location would be helpful. Wow — cool. That’ll be great, Preeti! I am coming to Bangkok on business in October (I come out about once a year) and I also do Crossfit. Are there any organized Crossfit activities in Bangkok? Just curious…I can always do my workouts at the hotel gym. Hi, Carlos. As far as I know, there are no organized Crossfit activities here in Bangkok. But I’ll certainly update this post should that change. Have a good trip. I will keep in touch as our trip become more defined! Where do you Crossfit in Thailand? My boyfriend and I are looking to come visit Thailand in the next couple of months and we have been crossfitting for approx. 2 years in Portland, Oregon. Wow, 100 burpees for time! That’s great that that is one of your favs! Hi, Jessica. I Crossfit at my local gym, which is spacious and new. And often I just run to a nearby pack and workout there. If you’re looking for advice about specific locales in BKK, feel free to email me. Safe travels.